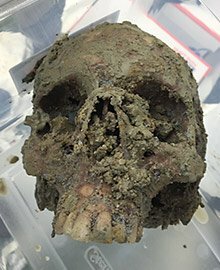 Penn scientists compared the skull taken from the Yeadon, Delaware County grave of serial killer H.H. Holmes with a line drawing of his skull – and its distinctive lumps and depressions – done by his doctors. And the teeth were sent for x-rays. With H.H. Holmes’ skeleton ensconced in a lab at Philadelphia's Penn Museum, archaeologists Dr. Janet Monge and Dr. Samantha Cox had one chief job. Keep it from breaking after decades marinating in Pennsylvania groundwater. The notorious serial killer, executed at Moyamensing Prison in South Philadelphia in 1896, had been buried beneath the water table in a Delaware County cemetery. Bone, Monge explained, is much like wood: "If it dries too quickly, it could shatter." So they would regularly spray distilled water on the bones to keep them from drying too quickly and then store them in a heavily air conditioned room. Only team members were allowed to touch the bones, which rested in baker's trays in Monge's lab, though by then any concern over possible tuberculosis had lessened. The killer of men, women and children would not claim any further victims. Monge and Cox were enlisted by Jeff Muggett and the History Channel to oversee the excavation of the deep grave, find Holmes's remains and, if found, determine their authenticity. A History Channel documentary, "American Ripper," this summer explored the suspicion held by Mudgett that his great-great-grandfather had escaped his hanging, fled to England and continued his slaying spree as Jack the Ripper. In May, the scientists did find the remains, including a skull. Now they had to attempt to conclusively identify them as Holmes. While the use of DNA in modern criminal investigations is routine, using ancient DNA – older than 10 years old – in a forensic investigation is not as common and remains highly specialized. DNA that old is typically used for broader inquiries, such as mapping the migratory patterns of people over time, not for matching century-old remains to living relatives, which was the goal in this case. After an unsuccessful search for a DNA lab in the United States to conduct the testing, the team looked overseas and partnered with the forensic experts at King's College in England, which has an international reputation in genetic and forensic science. H.H. Holmes, in a likely mugshot. To get the sample the Brits would need, Monge and Cox would have to perform a different kind of excavation. This time, they would have to drill into Holmes's skull for what Monge termed "the maximum intact yield" of DNA that wasn't degrading and contaminated. Using a diamond bit, they bore into the base of the skull, targeting the bone that protects the ear canal – the densest bone in the human body. A few grams of bone matter was extracted and sent off to their colleagues in England. Meanwhile, Monge and Cox employed more routine methods to help identify the remains and paint a fuller picture of Holmes. They took a scan of the entire body to have a record for history; his skull was sent to a dental school to have his teeth x-rayed. 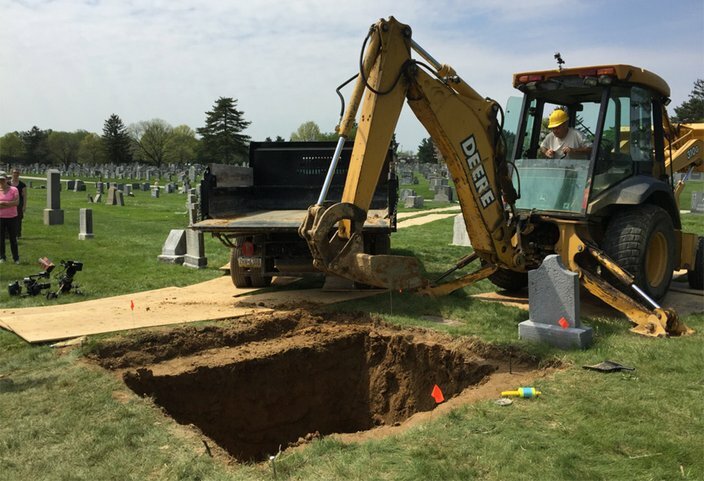 A backhoe commences digging at Holy Cross Cemetery in Yeadon, Delaware County. Because fingerprinting was just coming to fruition, Cox explained, Victorian doctors took very precise measurements of all the body parts of their criminal patients to help identify them, and possibly help explain why they were anti-social, if not psychotic. Holmes was reported of average height, around 5-foot-8, but skeletal remains indicated a much shorter man – between 5-foot-2 and 5-foot-5. “Lifts in his shoes,” Monge said, laughing. Driven by a belief in phrenology, a pseudoscience that tried to link every bump and knob in the head to a psychological condition, the doctors took meticulous measurements in a search for structural abnormalities to explain Holmes's aberrant and homicidal activities. "There are some wonderful Victorian things in the (medical) report," Cox said. "Things like 'we should have known he was a degenerate because his left arm is an inch and half longer than his right, and we should have known he was a psychopath because of this lump in the head.' But within all that is some wonderful data we can use now." For example, the Penn scientists were able to match the skull from the grave site to a line drawing of Holmes's skull, which included distinctive lumps and depressions. From dental records, which can be almost as precise as fingerprints, they knew that Holmes was missing nearly all his molars. 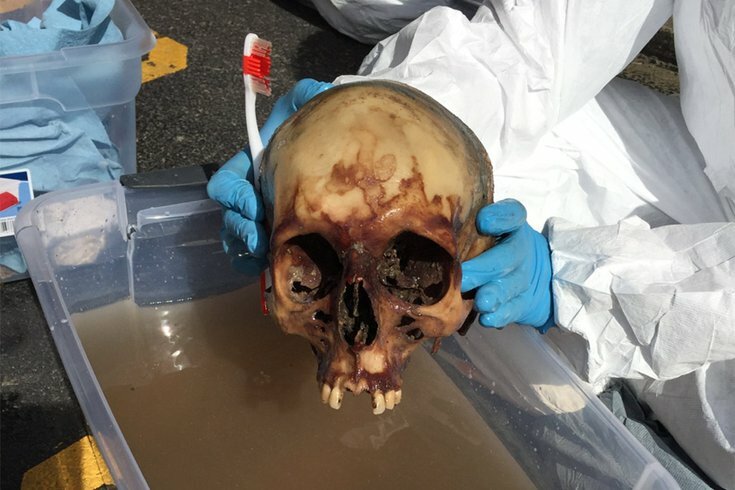 The skull they recovered was consistent with the records. They also found that some of his teeth had gold fillings, in line with the killer's expensive lifestyle. 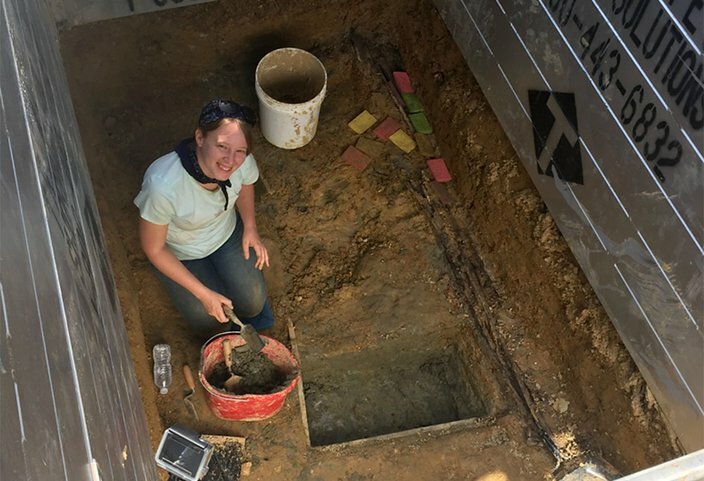 Dr. Samantha Cox, associate curator in charge of the Penn' Museum's physical anthropology section and a consulting scholar at the museum, digs at the grave of serial killer H.H. Holmes in May 2017. But they also found something at odds with the public record. According to published reports, Holmes was of average height, around 5-foot-8. The skeletal remains, however, based on stature estimates, were for a much shorter man – between 5-foot-2 and 5-foot-5. “Lifts in his shoes,” Monge said, laughing. “He was a con artist,” Cox agreed. "Not proportioned as your average person would be," he had short legs and long arms, Cox explained. But he was also, based on the length of the muscle attachments found on the skeleton, a very strong man. The skull of H.H. Holmes, born Herman Webster Mudgett, as it came out of the ground. Given the preponderance of evidence yielded by the bones and the gravesite, Monge and Cox felt confident they had their man as they waited for confirmation from England. Once again, however, the limits of current technology came up short for those longing for a simple yes-or-no answer. The first results from the DNA sequencing were a disappointing "inconclusive." The scientists in England were hoping to sequence 16 or 17 haplogroups, the collection of genes we uniquely inherent from our parents and ancestors, to match against Jeff Mudgett. They planned to have the worked wrapped up in a month, the Penn archeologists recalled. But, ultimately, it would take further testing and several more months for the final results to come in. "The best we can say at the end is that this skeleton we had is a relation to the Mudgett family," Cox said. Which, in the end, was the best they could have hoped for. Without a definitive DNA sample of Holmes to compare to the skeleton recovered at the gravesite, "we could never have been able to say 'This is H.H. Holmes,'" Cox said. Both Cox and Monge take evident and justifiable pride in the work they and their colleagues performed in excavating and identifying the remains at Holy Cross Cemetery as those belonging to Holmes. They are happy to have brought some closure to the Mudgett family and end the speculation that a murderer who had eluded law enforcement for so long had not escaped the hangman's noose. But they also confess a frustration that further scientific inquiry into the Holmes case is, for now, over. 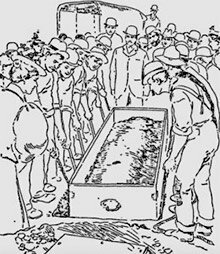 After a few weeks, and in keeping with the court order to exhume the body, Holmes's remains were returned to the ground. "We didn't want to have him reburied," Monge said. "For us, we felt we just started the (scientific) process, it would have filled out further details of his life. That would have been the normal scientific process. So it was a bit frustrating on that score." The body of H.H. Holmes is lowered into the ground, as sketched by the Philadelphia Record. For Monge, there are some evils that science will never be able to explain. “How do you have a person who commits these types of heinous crimes like that, we’ll never know,” she said. But it’s not hard imagining her making the effort given her deep wish that the Holmes research had continued. "Lots of folks don't understand the scientific process, where they think there's an end, but really no, there's always a new avenue, a new lab, a new process," Monge continuted. "That's what we do all the time, we test each other all the time. You loathe to give things up." "And nothing is ever definitive," Cox added. "The family actually wanted for us to keep the skeleton, but the court order and the archdiocese mandated that we rebury him. So that's what happened." Herman Webster Mudgett, the infamous H.H. 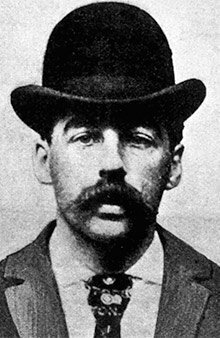 Holmes, who was deathly afraid that grave robbers would steal his body for dissection, was extracted on May 6 and went back to his grave on August 31.